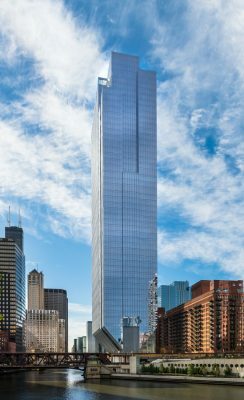 150 North Riverside is one of over 100 shortlisted buildings to win at the prestigious 2018 American Architecture Awards for the best new buildings designed and constructed by American architects in the U.S. and abroad and by international architects for buildings designed and built in the United States. 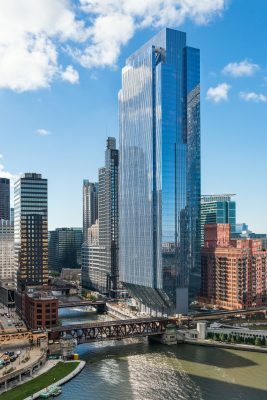 CHICAGO – (April 20, 2017) – Chicago-based developer Riverside Investment & Development celebrated the debut of the 150 North Riverside office tower, which opened for business in February, with an official ribbon-cutting ceremony today. Comprising 1.25 million rentable square feet, the building is located in Chicago’s West Loop on one of the most prominent sites in the city, bounded by Randolph and Lake streets at the confluence of the north, south and main branches of the Chicago River. 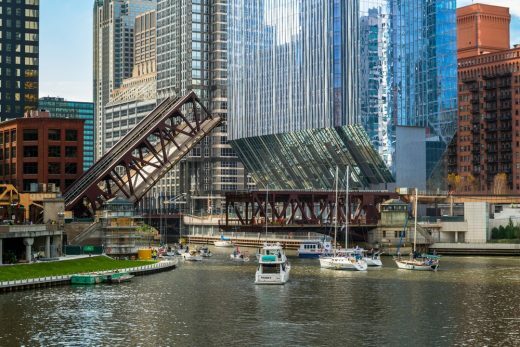 Designed by architecture firm Goettsch Partners (GP), the tower features a very narrow structure at its base in order to fit between seven active Amtrak rail lines to the west and the river to the east. 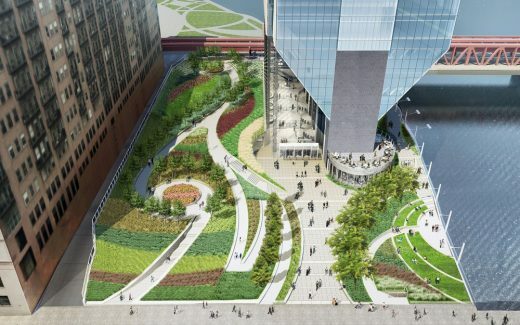 The building’s compact footprint opens up to highly efficient, column-free office floors above and allows for the majority of the two-acre site (more than 75%) to be developed as a landscaped public park, riverside amphitheater and riverwalk. 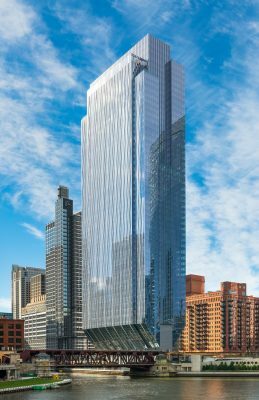 The 54-story building features a typical floor plan averaging approximately 28,000 rentable square feet, with the potential for up to 12 corner offices. 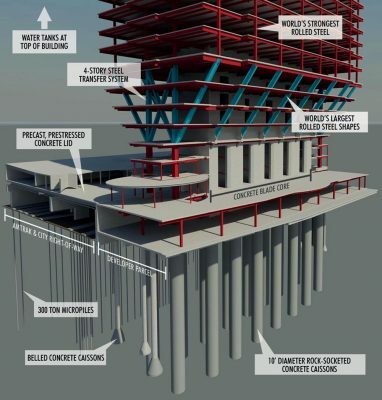 The first full floor is Level 8, sitting more than 100 feet above the plaza. Building amenity spaces include Porter, a Brendan Sodikoff and 4 Corners restaurant concept; Sodikoff’s hamburger restaurant Small Cheval; a high-end terrace bar; organic sandwich maker Hannah’s Bretzel; an 8,000-square-foot, state-of-the-art fitness center; and a large conference center including a junior ballroom and multiple boardrooms—all with water views. The property also includes a one-story parking garage tucked underneath a portion of the plaza park space. 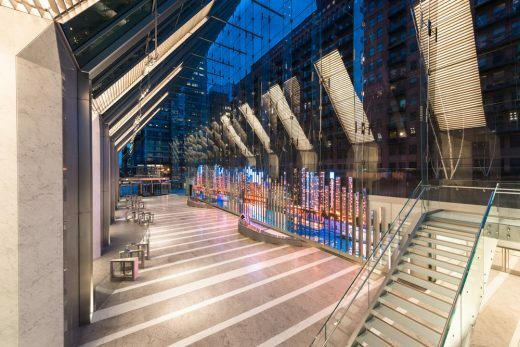 Pre-certified LEED Gold, the building’s sustainable design maximizes energy efficiency and provides ample natural light and open spaces on the interior; an extensive green roof system also covers the entire structure. Building and technology systems are some of the most advanced in the market, with the property Wired Certified Platinum for telecommunications infrastructure. Strong leasing activity resulted in approximately 85% of the building preleased upon opening, including the global headquarters for such tenants as investment banking firm William Blair & Co., Hyatt Hotels Corp. and Navigant Consulting, as well as the regional office of law firm Polsinelli. The main challenge of the development was its riverfront site. 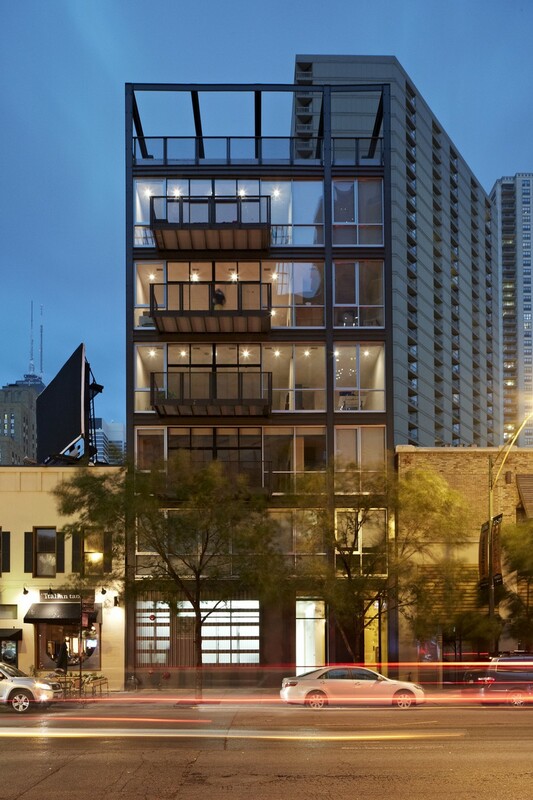 The project combined three narrow parcels into a two-acre site, with the building effectively sitting on the easternmost parcel and the two western parcels providing development air rights for a podium over active train tracks. 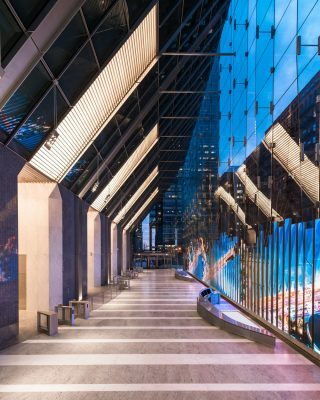 Utilizing a core-supported structure, the design features a compact building footprint with a 20:1 height-to-base ratio that opens the ground plane and allows for a dramatic, light-filled lobby. Taking cues from the river, vertical mullions undulate along the building’s east and west facades, creating an ever-changing pattern of light and shadow throughout the day. The north and south faces are divided into three vertical planes that accentuate the slenderness of the tower and step forward and back to mitigate the overall mass and provide select outdoor terraces. The largely open nature of the base, with no perimeter columns, offers the majority of the site as a landscaped public park with pedestrian pathways, outdoor seating and an amphitheather overlooking the river. In addition to Riverside and GP, the project team included structural engineer Magnusson Klemencic Associates, MEP consultant Cosentini Associates, landscape architect Wolff Landscape Architecture, and general contractor Clark Construction Group, among others. The building is also home to 150 Media Stream, a new media installation in the lobby that represents the convergence of art, architecture and technology in showcasing digital works from a rotation of distinguished artists and cultural institutions. Additional information on the building is available at www.150northriverside.com. 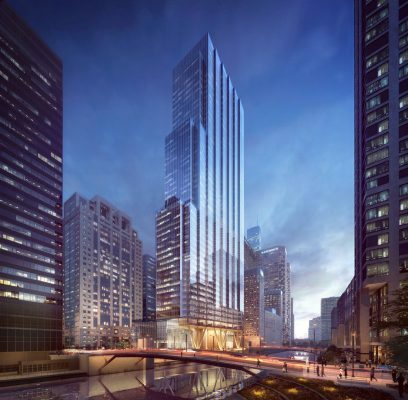 Riverside Investment & Development is a commercial real estate firm based in Chicago. Led by CEO John O’Donnell, Riverside actively pursues complex, large-scale real estate acquisition and development opportunities across a multitude of asset types, with a focus on transportation-oriented developments. Additional information can be found at www.riversideid.com.